By 1920 WRU saw the addition of 14 new buildings including the Armory (also known as Adelbert Gym, 1919), Amasa Stone Chapel, Mather House, and the Mather Memorial Building. The Dental School had moved from its downtown location to a new building on Adelbert Road. For the Student Army Training Corps (SATC) during World War I, WRU had built 2 barracks and a mess hall. They were razed after less than a year. In 1920, Case saw the dedication of the Warner & Swasey Observatory on Taylor Road in East Cleveland. The telescope installed was the one once used by Worcester Warner and Ambrose Swasey in their own personal observatory. During World War I, Case rented the Elysium, an ice skating rink located at the corner of Euclid Avenue and East 107th Street, for barracks for its SATC. Number of buildings in use by Case in 1920: 12. Number of buildings in use by WRU in 1920: 34. On this map you can see the Case and WRU campuses (except for the Law School). 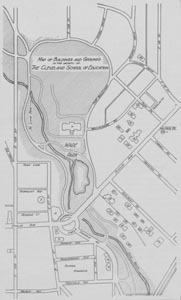 You can use the lagoon in front of the Cleveland Museum of Art (the museum is #7 on the map) as an orienting device. The circle for the streetcars (from which University Circle received its name) can be seen on Euclid Avenue. This map shows the WRU campus. You can also see the buildings planned for the new medical complex to be built during the 1920s.